In this article, we deconstruct the elements of successful auto coupons and explain which discounts work the best. Are too many cars driving past your automotive shop without getting an oil change? The time could be right to consider offering a coupon discount. If you’ve never offered a coupon before, the idea can be stressful. Will the coupon work? Will I lose money? How much of a discount can I actually afford? These are a few questions that may be swirling around in your head. In this article, we’ll answer those questions by looking at what has helped our automotive partners succeed. We’ll go over the basics of coupon design and provide examples of coupon discounts in each category that have the highest rates of return. What are the elements of a great auto coupon? First, every coupon should have the name of your auto shop. Most coupons have dotted lines surrounding the actual offer. This not only serves as a suggested perforation if people don’t want to keep the entire coupon, but they also highlight the offer. People automatically associate such perforation marks with discounts. 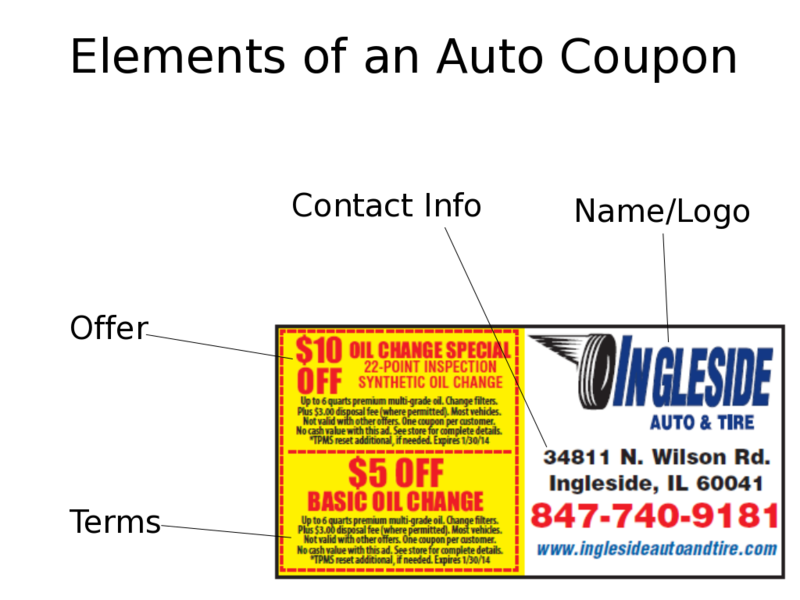 Your auto shop can also place terms and conditions in small print beneath the coupon. Expiration dates and “cannot be combined with any other offer” stipulations protect businesses from being taken advantage of by overzealous couponers. After checking off the essential elements (Business name, title, contact info, offer, and conditions), your auto shop can now consider design. Companies like Register Tape Network use a team of designers to ensure that coupons are attractive, focused, and use art consistent with a company’s personality. Logo – Coupons not only provide an incentive for new customers to visit your auto shop, they also build stronger branding. Adding your logo can strengthen brand recognition before they’re redeemed. Creating the offer is perhaps the most important part of the coupon creation process. As is the case with all advertising, people are interested in how much money this small piece of paper will save them. The heart of the coupon —the offer — is what makes your coupon worth cutting, saving, and using. “$10 off” instantly transforms your coupon ad into a ten-dollar bill. How do I create an automotive offer that works? Offers that discount a primary service (like an oil change) are generally the most successful for auto and quick lube service places. Simple and Affordable Offers – The most effective coupons will advertise an oil change at a discounted price—typically under $20. Commonly, auto places will want to avoid percentage discounts. Dollar amounts have greater perceived value. Stick with dollar amounts, whether it’s money off a service or an exact quote, and more people will redeem your coupons. Free sells – This may seem contradictory, but it’s true! Auto and Quick Lube shops can offer free assessments and alignments with very little additional expense. These freebies are also a great opportunity for your mechanic to upsell. Upsell – Bringing in the customer through discounted services then allows your shop to sell premium services and products as clients may need them, such as synthetic oil or air conditioning filters. Register Tape Network partners with thousands of retailers in 33 states and has helped several auto shops diversify their marketing to gain a stronger presence in their communities. Here are just a few notes from our many satisfied customers.